However, one of the best things about being a journalist is that, while others might fume and fulminate at their local bar against the various aspects of modern life that they find infuriating, we are granted a platform to express our views! It would take a dedicated pessimist to imagine that there will be any lessening of demand for high-speed rail travel in the next decade or so. 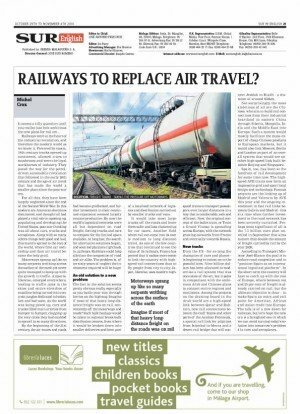 This surely means that air travel will no longer seem like the only option, especially for travellers who intend only to move from one part of the country to another. Why spend two hours waiting in an airport for a flight from Málaga to Madrid, when the new AVE rail link can whisk you there in not much more time than that? The following piece appeared in the October 29th-November 4th edition of Sur in English. Click here to read it on Sur’s website. This entry was posted on Friday, November 5th, 2010 at 1:53 pm	and is filed under Travel. You can follow any responses to this entry through the RSS 2.0 feed. Both comments and pings are currently closed.